Himachal Pradesh has a vast hydel potential to the tune of approx. 21,000 MW (approx. 750 MW under Small Hydro Sector) in the five river basins, 6037 MW harnessed so far. Small hydropower has been recognized as re-liable, eco-friendly and renewable energy source, which can be exploited in decentralized and cost effective manner. Himachal Pradesh Government attaches significant importance to the exploitation of small hydro potential. 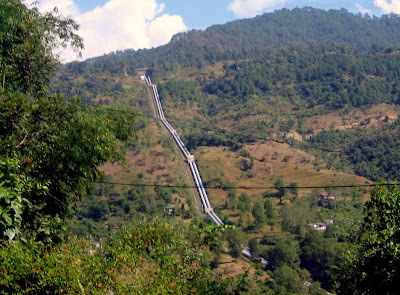 The first hydel project of north India, the Shanan power project is located in Himachal in Jogender Nagar in Mandi distt. The State Government has taken several initiatives to encourage private sector participation in small hydro power development. Himachal Pradesh is among the few States, which has streamlined and crystallized the various procedures to minimize the bottlenecks and has also finalized the Implementation Agreement and Power Purchase Agreements for small hydro projects. The process of exploitation of hydel potential in small hydro sector through private sector participation began during 1995-96. Since then, the allotment of project sites has been a continuous process and till 31st Dec, 2006, MOUs for 299 projects have been signed . 93 projects have been cancelled / declared unviable for various reasons. At present 206 projects with an aggregate capacity of 547.50 MW are in existence , out of which eight projects with an aggregate capacity of 20.65 MW stands commissioned and 90 projects with an aggregate capacity of 299.40 MW are at Implementation Stage. Rest of the projects i.e. 108 Nos. with an aggregate capacity of 227.45 MW are at MOUs stage. Power Purchase Agreements for 38 projects have been signed. The most prestigious and major project on river Sutlej in the state is the Nathpa Jhakri (1500M.W). It is constructed in collaboration with the central government. The project is funded by the World Bank.The foundation stones were laid of 300MW Chamera II Hydel Project in June 1999, of 2051 MW Parbati Hydel Power Project in December 1999, and of 800 MW Kol Dam project in June 2000. Other major ongoing projects are : Bhaba Augmentation Scheme, Ghanvi Hydro Electric Project (22.5 MW), Larji Hydel Project (126MW) and Khauli Hydro Electric Project (12MW). The state government has given eight hydel projects for private sector participation. These are Baspa Hydro Electric Project (300MW), Holi Hydro Electric Project (231 MW), Dhamwari Sunda Hydro Electric Project (70MW), Project (15MW), Allian Duhangan Hydro Electric Project (192 MW), Swara-Kuddu (162MW) and Budhil (70MW).